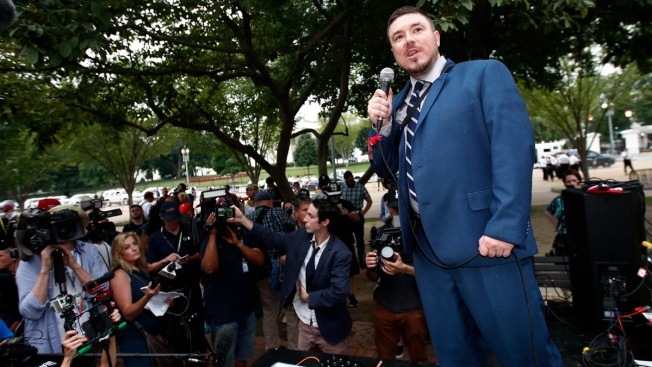 In this Aug. 12, 2018, file photo, white nationalist Jason Kessler talks during a rally near the White House on the one year anniversary of the Charlottesville "Unite the Right" rally in Washington. Jeffrey Winder, a Virginia man convicted of an assault against Kessler, the organizer of last summer’s violent white nationalist rally during a news conference, has been handed a $1 fine. A Virginia man convicted of punching the organizer of last summer's white nationalist rally after he attempted to hold a news conference has been fined $1.